Woo the week just flew by, it is fess up time again!! I know there are more of you out there just itching to get it out about how bad your week was, what a monster your baby was or how you felt like a bad mom for having low patience one day. This is perfect place to get that off your chest. This is a judgement free zone, we are all aware there is no perfect mom, there is no perfect child so do not be afraid to use this as a forum to just get it off your chest no matter how small it is because the more stories there are here the more it makes that struggling new mom feel more sane. My confession for the week is my child was that screaming, kicking, laying down on the floor demon running amok in the Dollar Tree. I seriously try to avoid going out with Dean unless my husband is with us to wrangle him, but I figured a quick trip to the Dollar Tree with my mom and my sister would be easy and it was at first. Sure he refused to hold my hand and sure he ran down to the end of the aisle before me but it was all manageable, he was in a good mood. We were almost done when my luck ran out, homeboy just broke down, running, yelling, so I gave him a mylar balloon and that seemed to calm his craziness until the ice cream counter (when the hell did the Dollar Store get one of those -_-) it was like 90 degrees outside and he is a disastrous ice cream eater to begin with and we still had one more errand to go, so there was no way he was getting ice cream. Now I am that mom that usually gives their kid whatever they want (within reason) in a store to get them to behave (spare me the lecture on how that makes him misbehave the next time because he knows he will get prize blah blah blah, I am aware) but there was no way in hell he was going to get ice cream in the sweltering heat, in his carseat, in my mom’s SUV, just not happening. So I told him we would get ice cream at the next store, and that worked long enough for my mom to check out, when it was my turn I could see him running through the aisle whacking everyone with his balloon (thanks to the mylar strapped to his wrist I could see exactly where he was running to) and by the time my mom got him to the front of the store he was laying on the floor kicking and yelling and the lady was still checking me out….and it seemed like an eternity. I stared at the register wishing it to go faster and also to avoid having to make eye contact with any of the other people in the store who were now witnessing my toddler tantrum throwdown. I know you moms know what I’m talking about, those last few minutes before you can get your screaming kid out of the store and everything is running in slow-mo and you can just feel the heat of embarrassment creeping up the back of your neck. My sister grabbed my bags, I paid for my stuff, scooped my maniac up who then proceeded to do everything he could to get down making for an awkward trek to the car. 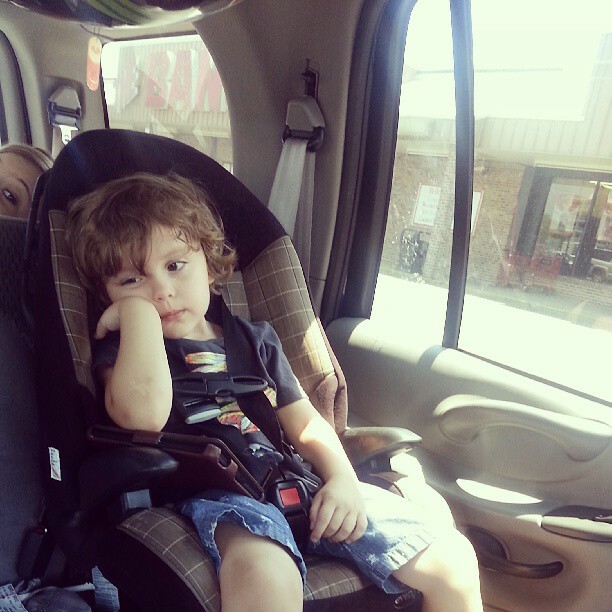 Then the carseat battle, you know when they are crying and keep going limp and slipping out the bottom onto the floor board (again all in 90 degree weather). I finally got him in there and heard the triumphant click of the last damn buckle, leaning on his open door I sighed a breath of relief just as he decided to open his mouth and scream across the parking lot……..
Come on ladies fess up, you know you want to!! I have 10 Lovely Comments, I would love to have yours... on Fess Up Friday! So my fess up for the week is that I fell asleep on the couch while my five year old was happily painting a plate for a whale craft he wanted to do. We were chatting while he was painting and I dozed off for what felt like two minutes. I opened my eyes and saw him trying to clean blue paint off the carpet with a wet wipe. There was blue paint all over the carpet, up the wall and on the ceiling! He said he spilled but I have no idea how that big a mess could come from a spill. So instead of our quiet afternoon, I spent an hour and a half shampooing the carpet and scrubbing the walls which still have a blue tint to them. So much for “washable” paint! LOL, you poor thing! I have so much to look forward too…. yay? Lol!!! Oh yes looootttss to look forward to! Yeah… sounds about right! My 6 year old is currently fascinated by the “f- word” and keeps asking me when he can say it… Oh, just another 12 years or so, honey….. Sigh….. Lol!!! That is soo cute that he asks lol!